Mansfield Town v Cambridge'Stags' captain, Lee Collins, puts the last cross of the first half into the Cambridge box. For the second successive season, Mansfield Town and visiting Cambridge United battled out a drab 0-0 draw at One Call Stadium this afternoon. On a day when Stags could have gone top and bottom side United were looking for a first League win, the game failed to catch alight in tough conditions, with a string wind and continual rain. The visitors did have an early effort chalked off for offside and wasted the best chance of the game. Both teams enjoyed spells of possession, but chances were few and far between. Stags’ star performer was Krystian Pearce, who was immaculate at the back, while Mitch Rose looked the most likely home player to break through with three good attempts on goal. Pre-match, Mansfield had been dealt another injury blow when it was announced striker Danny Rose will be out for a few weeks with a fractured eye socket. Rose was due to return from a three-game ban next weekend but was allowed to play against Doncaster in the EFL Trophy in midweek when he sustained the injury. They already have Jack Thomas, Chris Clements, Kyle Howkins on the sidelines. New signing Alex Iacovitti was named on the bench this afternoon. Otherwise the starting XI included six changes from the midweek side with returns for Mal Benning, Lee Collins, Matt Green, Kevan Hurst, Mitch Rose and Darius Henderson. Jamie McGuire, who suffered a knock in midweek, was able to return to the bench. The game began in the incessant rain that had been falling all morning. There was a scare for Stags on four minutes as United skipper Berry headed home from six yards from a Pigott cross from the by-line, but an offside flag was already raised. 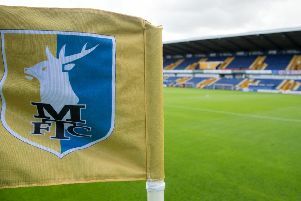 On 11 minutes Mitch Rose came up with Stags’ first goal attempt as he volleyed a clearance from a long Chapman throw over the bar from 20 yards. On 24 minutes Rose came close with a snapshot from the edge of the box which Norris got down well to block. Benning had to come up with a goal-saving tackle on 32 minutes as Newton raced into the box and looked set to pull the trigger, the full back sliding in to make the block and concede a corner. An ambitious Rose also cracked in a dipping shot from over 35 yards on 41 minutes, but keeper Norris was well placed. Stags’ first corner of the game was cleared in the one added minute as a drab half ended goalless. Taft was booked for a shoulder barge on Pigott on 52 minutes as the second half continued almost as uneventful as the first. On 54 minutes Stags threw on the pace of Hamilton for the brawn of Henderson to try to liven things up. Taft was lucky not to be sent off for a second silly foul as he flattened Mingoia on 57 minutes. The visitors should have gone ahead on 61 minutes as Berry crossed from the right and an unmarked Newton somehow placed his finish wide of the far post from eight yards with Shearer at his mercy. On 64 minutes Stags made a second change with Hemmings on for Hurst. Mingoia cut in from the right to curl an effort over the angle on 71 minutes, and a minute later Bennett headed over from a corner for the home side. United enjoyed a good spell of pressure as Stags struggled to clear the ball against the strong wind, but Mansfield cleared two corners and survived. Then Hamilton had a shot blocked for a corner by Dunne, but the United man stayed down and eventually was stretchered off with a brace on his leg. With ten minutes to go Stags went for broke and withdrew midfielder Rose for striker Hoban. Pearce was booked on 86 minutes for a foul on Berry, who went down very theatrically. Five minutes were added at the end but no one could produce a breakthrough on an afternoon to forget. STAGS: Shearer, Bennett, Benning, Collins, Pearce, Taft, Chapman, Green, Hurst (Hemmings 64), M. Rose (Hoban 80), Henderson (Hamilton 54). Subs not used: Jensen, Baxendale, McGuire, Iacovitti. CAMBRIDGE: Norris, Halliday, Legge, Dallison, Taylor, Dunne (Clark 81), Newton (McGurk 69), Berry, Mingoia, Pigott (Williamson 62), Elito. Subs not used: Gregory, Coulson, Gosling, Ikpeazu. REFEREE: Dean Whitestone of Northants. CHAD STAGS MAN OF THE MATCH: Krystian Pearce.